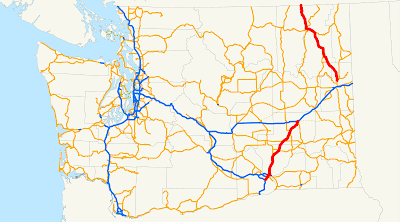 On Saturday and Sunday, September 6-7, 2014, I drove the length of Washington State Route 395, which just so happens to be signed as US Route 395, but they're not quite the same thing. 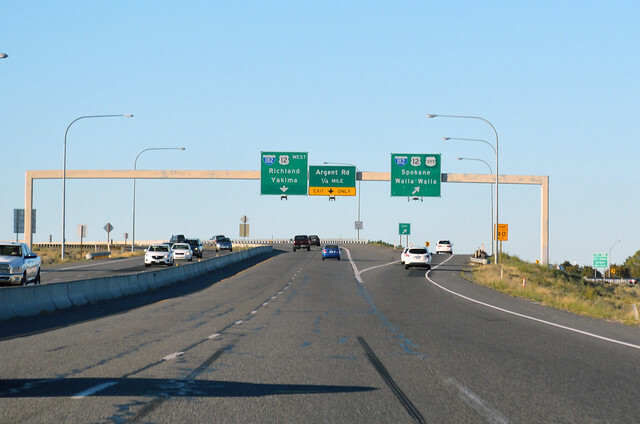 At an interchange with I-82 south of the Tri-Cities, Washington State Highway 395 begins. US Route 395 begins near Hesperia, California (I've actually driven a large chunk of US 395 in California and Nevada, but that's a different story or two. 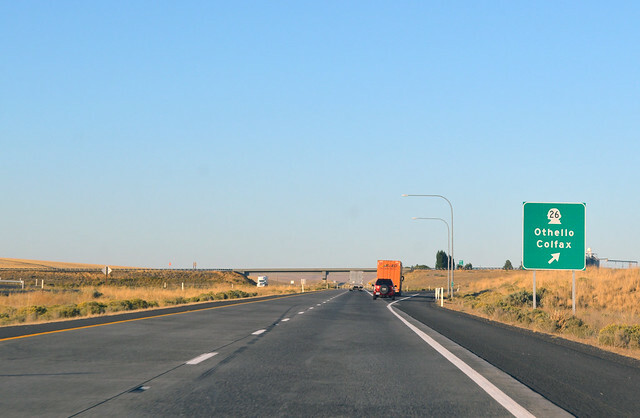 ), and is co-signed with I-82 from Oregon to this point, but since the legal description of the state highway begins here, here is where we began. 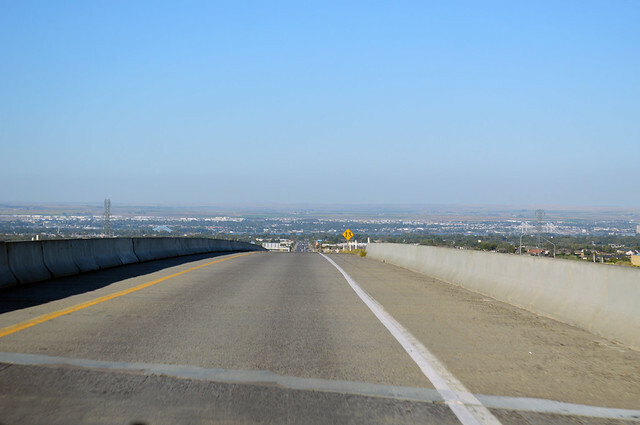 Down the hill, welcome to Kennewick. 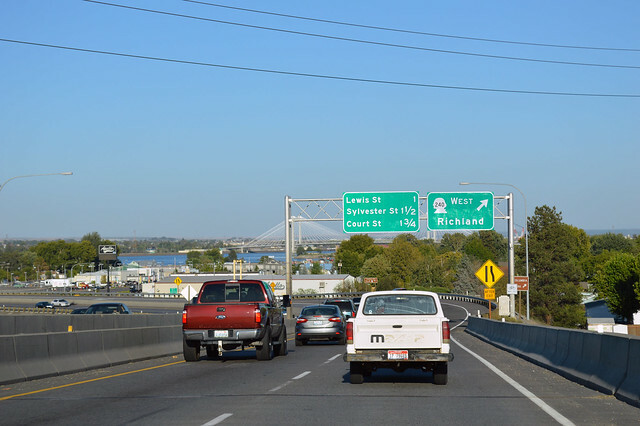 Down another hill, welcome to Kennewick again. Stoplight, stoplight, store, store, store. By the banks of the Columbia River, we arrived at the interchange with SR 240. We crossed over the mighty Columbia River on the big blue bridge and entered Pasco. Stay to the right. 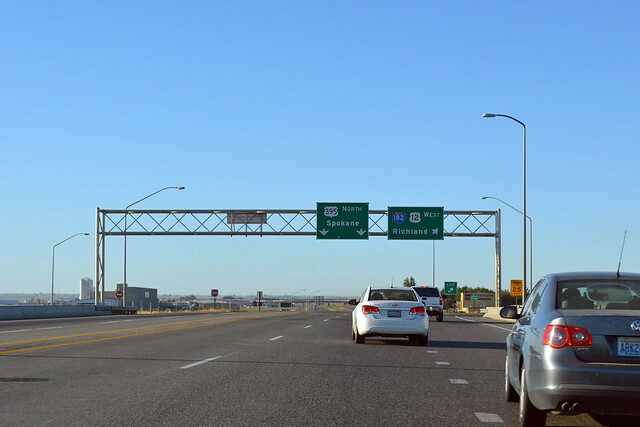 Pasco likes interchanges more than Kennewick. 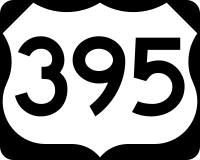 At this junction with I-182, SR 395 comes to a temporary end, but US Route 395 hangs a right. 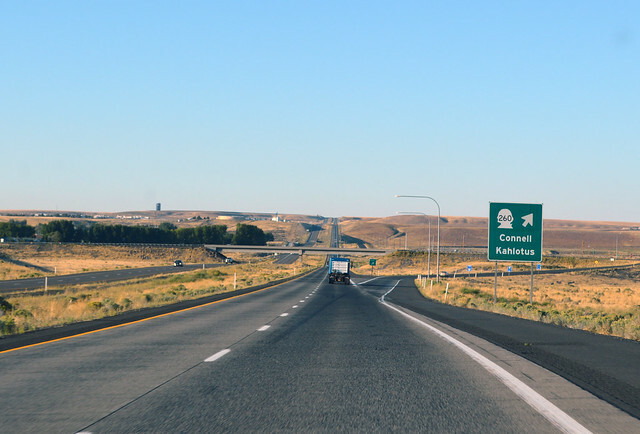 A couple miles east, SR 395 resumed (and it was even signed once just north of here as a state route, with Washington's silhouette instead of the US Route shield!). This is a junction with SR 397 behind us and I-182 below us. Northward we flew, out of town and out into the farmland. Cows standing still, a train rolling south. 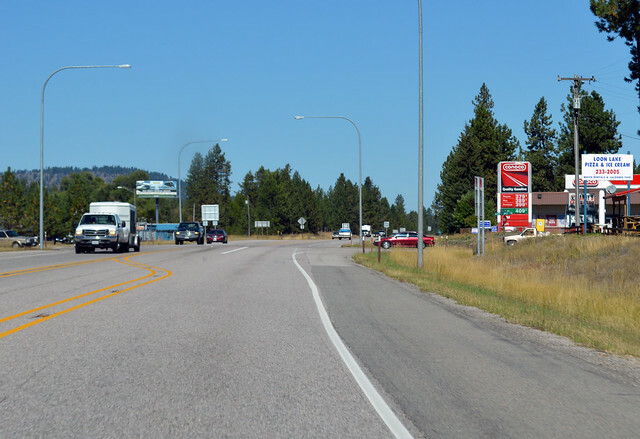 US 395 finds its way into Esquatzel Coulee, which we briefly left just in time for this junction with SR 17. Exit here for Scooteney Reservoir. Rolling, rolling, rolling. Upon onto the endless plains. Rolling, rolling, rolling. Where Esquatzel Coulee meets Washtucna Coulee and Providence Coulee is the town of Connell and this junction with SR 260. Coulees aren't always as dramatic as the grand one. Rolling, rolling, rolling. Chunlin rolled through the satellite radio dial. Rolling, rolling, rolling. In the fairly subdued Hatton Coulee, we came to a junction with SR 26. Watch out for cougars. US 395 heads up Hatton Coulee for many dry, fairly straight, very quick miles. But then we dropped down into Lind Coulee instead, and came to this junction with SR 21 near the town of Lind. We rejoined the BNSF railroad, which we hadn't seen since before SR 17, as we headed up narrow Paha Coulee. Rolling, rolling, rolling, and we reached I-90 at Ritzville. The sun was going down, so we stopped for the night. Familiar tune, that is. 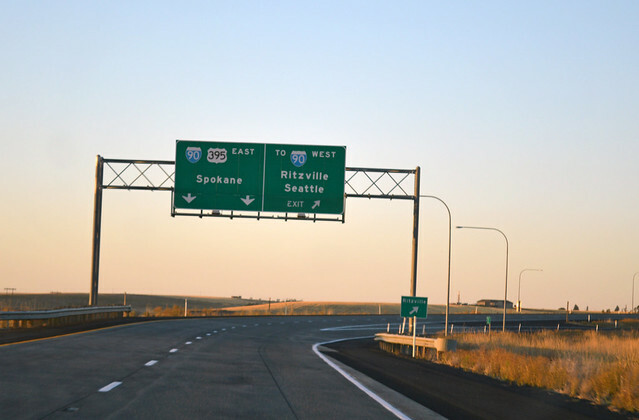 US Route 395 is co-signed with I-90 to Spokane, then exits with US 2 to head due north through the city. 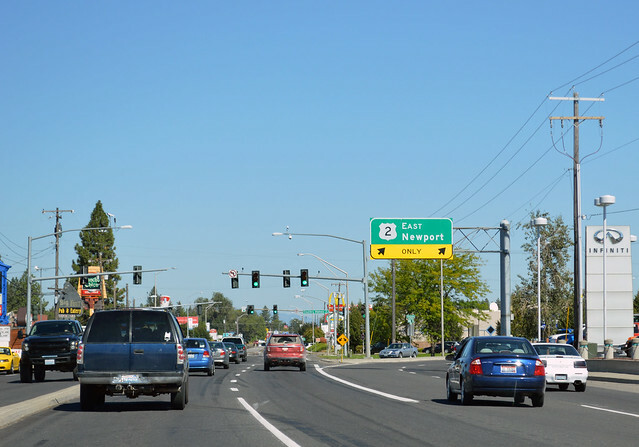 State Route 395 resumes at this Y junction known as "the Y" in north Spokane. US 2 branches off to the right and we went straight. Stoplight, go, stoplight, go. Escape from Spokane! 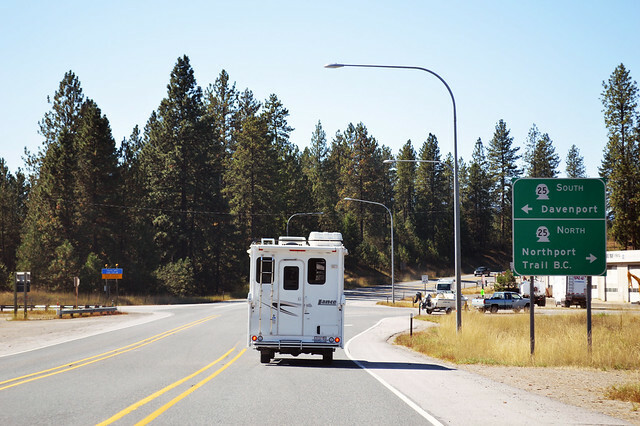 At Wandermere, we merged onto the freeway portion of US 395. 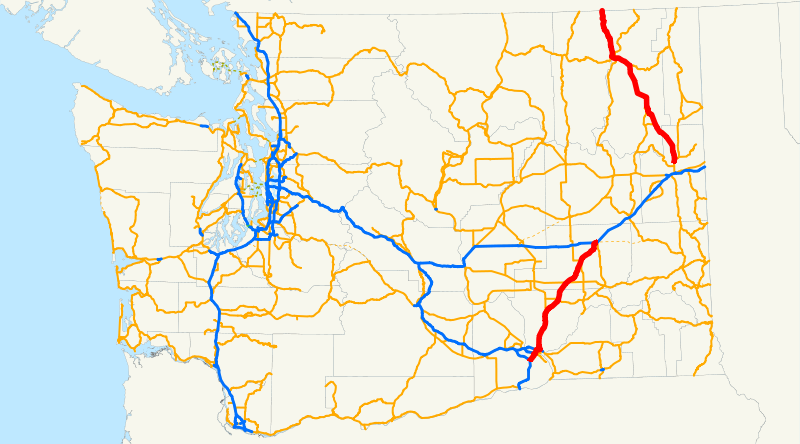 Sometime in the future, US 395 will be routed on a freeway from I-90 to here via the east side of Spokane, but it's only built for the northern half of that, so far, and isn't included in the legal description of the route. I therefore didn't drive that branch (this trip). We quickly zipped northward through forests and fields. Headlights on for safety, because it's such a boring highway. Straight and fast. At Loon Lake, we found this junction with SR 292. 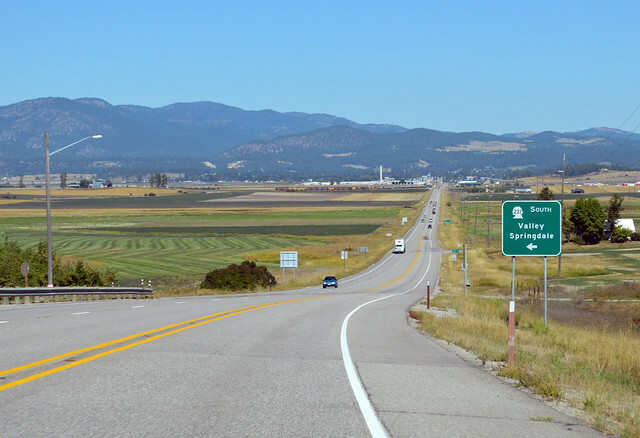 After a bit more of the boring highway, we dropped down down down to the Colville Valley. Almost to the bottom, we blew past this junction with SR 231. Good thing it's signed, because otherwise it's invisible. Due north we headed, down the Colville Valley. The Colville River is a ditch at this point, but it will get bigger. 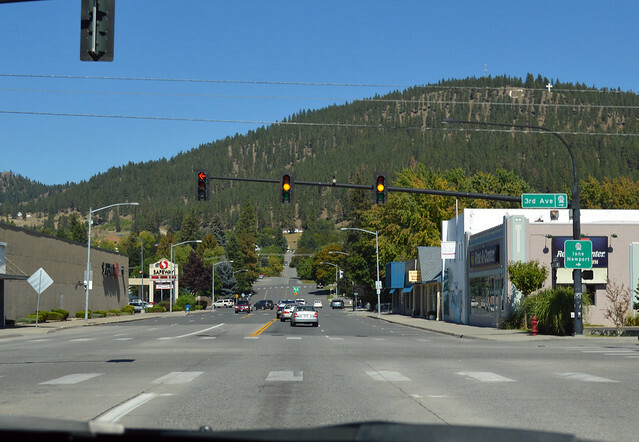 Route 395 slows down for Chewelah and then Colville, where we found a junction with SR 20 in the middle of town. US 395 was not such a zippy highway anymore. More curves, slower drivers. 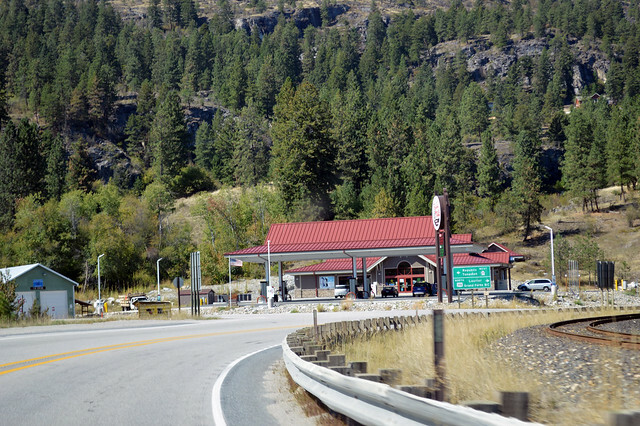 Still following the Colville River, we arrived at the town of Kettle Falls and then a junction with SR 25. 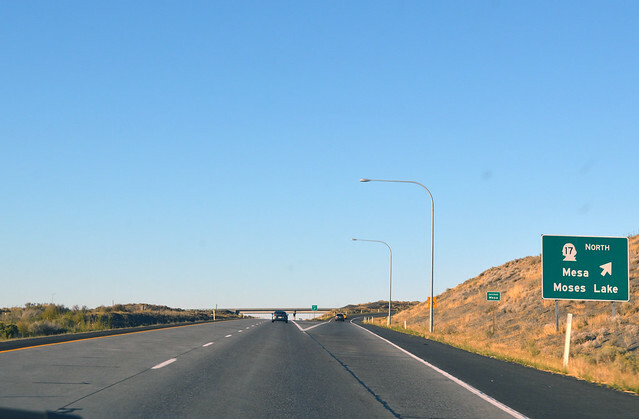 SR 20 is co-signed with US 395 for this stretch of road. Almost to the Columbia River, we stopped at the St. Paul's Mission site on the old portage road around what once was the waterfalls of Kettle Falls (which the town took its name from, and was since flooded by Grand Coulee Dam, as was the original town...). Quiet pine forest by the lake. Back in the car, we crossed high above the lake/river and had another junction with SR 20. SR 20 turns downriver and we went up. Suddenly we were on a quiet, winding back road. It felt so odd. It was US 395, but we saw very few drivers. We followed the railroad north, up the Kettle River. Local kids stopped and watched the car drive by. Quiet. 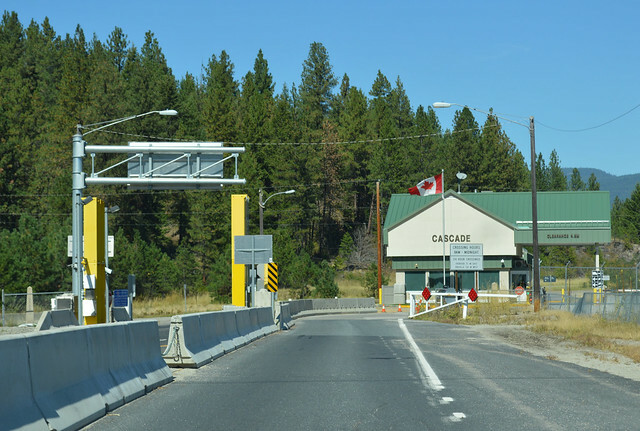 After many miles, the narrow valley widened up just in time for us to arrive at the hamlet of Laurier, which boasts a crossing into Canada and not much more. Thus, this was the end of US Route 395. 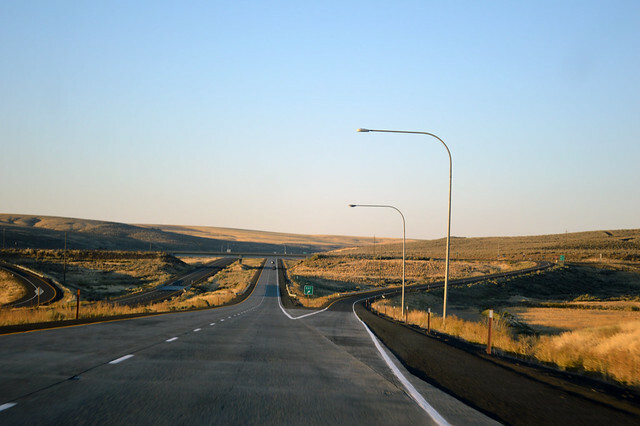 For the most part, US 395 in Washington is a speedy expressway. Its job is to move people and it does it quite well. Only at the very northern end, however, was it an entertaining drive. That was, naturally, the part that most people don't use.